One of the most persistent myths about Waldorf Education is that children are not taught to read until “later,” usually meaning about the third grade. This myth arose not because Waldorf educators use entirely different methods from mainstream educators to usher children into literacy. Rather, Waldorf educators begin with a concept of child and human development that helps to inform what we do and when. Engaged in the world of song, story, and movement. Follow me into a recent morning onto the early childhood playground at the Detroit Waldorf school. The children are playing outdoors in the bright, early spring morning, making mud pies, swinging, and enacting bird and animal and family scenes. They have been savoring the spicy air and their voices rise and fall like the sudden appearance of robins. Freed from the heaviest of their winter gear, their limbs stretch and reach, chasing each other on winding paths around trees and on the playscape. They gentle spring breeze urges them to greet each visitor on the walkway and It takes a little bit longer to “board the train” as the teacher sings them into line to go inside. Circle time is a flow of images from the teacher’s melodic voice. The children form a golden circle and then flow through a variety of gestures and games as their teacher leads them through song and verse. Later, after free play and snack time, the children are gathered together in front of a long table set up in a springtime nature tableau of silk and wool. A story commences, with needle-felted characters gently moved by the teacher’s hand and voice. The gesture of the children during these times is pure absorption. They are totally engaged in this world of song, story, and movement. What might not be recognized, however, is the children’s learning in the language arts – the art of language. These children are being ushered ever so deeply into the world of literacy. Garden path of experience - creating a reality through play. Waldorf education is based on a view of the developing child as a spiritual being gradually growing and building the capacities for an adulthood of self-determination, self-reliance, and balance. Critical to this approach is the belief that each stage of childhood calls for a specific educating environment that calls forth the powers inherent in the child. In early childhood, the ages between birth and seven, our littlest children are brimming with the forces of life. The world swims around them, hopefully, a world of beauty, of sound, of music, of warmth. These little ones have entered a garden path of experience. Play is their modus operandi – they seek to create and recreate the world in language, in drawing, and, most of all, in activity. Play – inner initiated cognitive work – is how children digest the world through their senses. They imitate the purposeful work, gestures, songs, and words that surround them and as they develop the faculty of fantasy, begin to be able to project their budding inner life on the world around them. By school age, they begin to play with others and stories become more important too. Simple fairy and folktales, nature stories, and biographical accounts of grownups when they were little, all bring a way of ordering experience for the young child. Song, dance, rhythmic gestures, and movements of all kinds help form the basis for memory. Toward the end of the garden path, play becomes more intentional, deliberate, and consequent. Games are intended and planned, remembered from one day to the next, and are more specific and choosy in the way they are played and in the choice of who plays them. By the age of 6, the child is creating a reality through play – and the play often becomes more inward and the few props that are needed support the child’s assuredness that the inner world is as real as the outer world. It is at this age that images become imagination and a new engagement with story begins. So, in that early childhood classroom, all the foundational forces for deep literacy are apparent. The children were engaged in imaginative play. Images and melody were used to guide the children in specific movement activities that helped to bring equilibrium, lateral dominance, directionality, and other skills needed for writing and reading. A story – a coherent narrative about the world – was brought in a warm, textured way. Listening and speaking skills were cultivated and an aesthetic sense for what is beautiful and true was enriched. These capacities – tended so well in the garden of childhood that is a Waldorf early childhood classroom – are the foundation for building literacy (and numeracy) skills. In first grade, then, the Waldorf class teacher will invite her young charges onto a new path – an exciting one through the woods! There she will help the children build on their newfound confidence that comes with moving into a new stage of childhood. Through the development of inner picturing, the children now have new capacities for higher learning. Story remains primary, but the stories are more complex and reflective of large swaths of human experience. The language arts are social, and symbolic systems – such as the alphabet – are now ready to be digested in new ways. The letters are introduced through stories that are the result of human experience. The children recite, draw, and learn to read letters and words that are authentic, meaningful, and beautiful. They write and illustrate stories in their lesson books, bringing their left brain’s burgeoning knowledge of phonics together with the right brain’s need for context and seeing the whole. 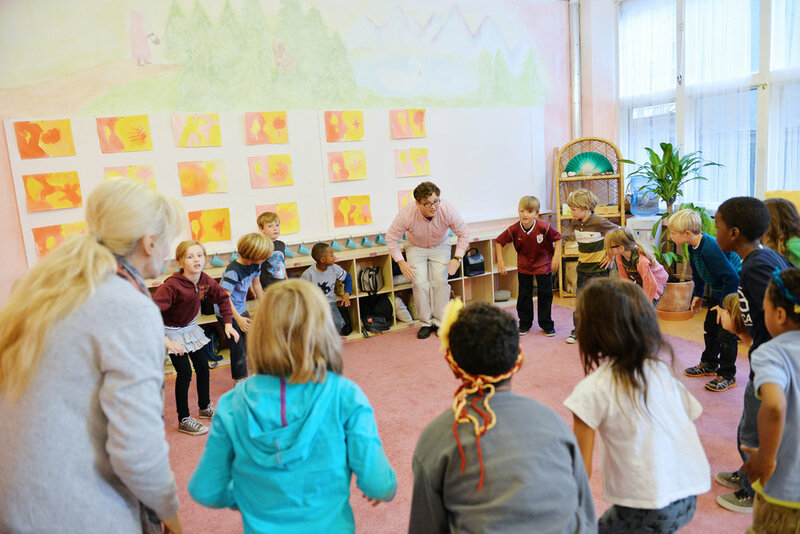 The class teacher works through movement, image, and language to help build memory, reflection, and comprehension. Dictations and games secure the neural pathways for writing and reading. The teacher chooses among a plethora of beautifully illustrated class readers to satisfy the aesthetic sense and to give practice reading good stories. Eurythmy, class plays, the learning of an instrument, along with the contrasting melodies of Spanish and German help to solidify the English language arts throughout the grades. For a long time, debates about early literacy instruction fell into two camps: Either proponents emphasized a phonics-based approach where students learned the code first, or a whole-language approach where students were taught to associate and decode words based on prior knowledge and experience. Generation after generation, the pendulum has swung one way or another, but more recent research has confirmed that a balanced literacy approach is much more effective. Phonics-based instruction, combined with authentic and consistent literacy opportunities seems to be the best recipe for building competent writers and readers. The Waldorf approach to literacy includes such a balanced approach – but so much more. Our attention to immersion in authentic play; our focus on healthy development of movement; and our emphasis on the aesthetic and social aspects of the language arts help assure the effectiveness of our developmental approach. Linda Williams, PhD, is fifth grade teacher and college co-chair at Detroit Waldorf School.